Bob, I'm going to pick up the criticism again of your strategy/tactics against your former friends. If you are playing 3D chess or something that isn't making any sense to us and you have a bigger vision than what we can see, please give us a hint at what we are missing. your replies there haven't satisfied me. Your actions are self destructive to your original mission and now they are destructive to the advancement of USHGRS. In the short timeline of this kerfuffle, I have personally sidelined ideas to advance or assist USHGRS as you crash the cause and momentum. I'm asking now, as a club and as a member, for you to change course of tactics in attacking your best members. A regrouping is needed and it needs to happen now. Frank was never your enemy until you made clear that he was going to be your enemy. I hope it is not too late to reverse course. Frank Colver wrote: I did more than anybody to help Joe and USHGRS but you didn't want me to succeed because you want known HG names to be banned so they can only post your site. I finally understood your secret agenda to get and keep people banned from HG.org. It's all about you and your personal fights. You don't care about USHGRS. Joe Faust, or anything else except your personal fights. You were sabotaging my efforts to get Jack to accept Joe and USHGRS. I had almost succeeded when I realized that you didn't want me to succeed. Too bad that Joe is caught up in your personal vendettas. Since you deliberately misname my project, like some school kid bully, and insist on hijacking my design thread for your own agenda, I will no longer be posting on this "all for Bob Kuczewski" web forum. US Hawks could have been a great site if not for your personal vendettas and you making it your personal battleground. It's all about you but it took me longer than some others to realize that. I feel sad that I expended so much energy and time trying to help you. Remember this project is for the good of hang gliding and it will only cost me a lot of money, with no personal return except the satisfaction of seeing more people learning to fly. Any replies to this posting will not be seen by me. BTW - Please Bob seek professional help for your condition. I liked you and I want to see you get well and productive instead of hate filled and unreasonably twisting things into your personal fight. I wish you hadn't destroyed our friendship. Bob Kuczewski wrote: Frank, you allowed Jack Axaopoulos to bully the people you called "friends" and you did nothing to help them. Now you promote the site and the person who did that to your "friends". Your definition of "friendship" does not match mine. None of that is true except that Frank's definition of friendship probably does not match your Ranger definition of friendship. I think the military has programmed a fighting robot brain in you that ignores realities of the situation in favor of an ultimate sacrifice for a cause. The reality is that getting banned would not have advanced the cause. A needless casualty that mostly is the realm of tactics and strategy of the military. You would be banned by Jack for the post you just made because that's the only way Jack can win an argument. I have no impulse to ban you because my arguments are rock solid. Technically, your arguments are partially true. If everyone was willing to get banned.. get their communication lines severed, your strategy would work. Your argument/strategy is flawed because you didn't figure in that you could not implement your argument/strategy. Do I need to go further? If you don't see this, thus-far, it probably doesn't matter. I'm out of time for now and I haven't added anything to advance USHGRS. That's the fall out of all this rancor. Nothing is moving forward as you drive good people away. Free wrote: Bob, I'm going to pick up the criticism again of your strategy/tactics against your former friends. Translation: You're going to criticize my right to criticize. Reply: Fair enough. All sincere criticism is welcome here - both yours ... and mine. Free wrote: If you are playing 3D chess or something that isn't making any sense to us and you have a bigger vision than what we can see, please give us a hint at what we are missing. Here's your hint: 'All it takes for evil to thrive is for good men to do nothing." Look at either USHPA or Oz or hanggliding.org for all the proof you could ever need. Free wrote: Your actions are self destructive to your original mission and now they are destructive to the advancement of USHGRS. My original mission started decades before USHGRS and even decades before the U.S. Hawks. My original (and ongoing) mission is to do my small part in a big world to advance the cause of justice for as many people as I can. My efforts in hang gliding are just a glimpse into that life-long mission. I'm not perfect at it, but I'm trying. Free wrote: In the short timeline of this kerfuffle, I have personally sidelined ideas to advance or assist USHGRS as you crash the cause and momentum. Stop doing that. Do what you can for USHGRS (and the US Hawks?) every day! Free wrote: I'm asking now, as a club and as a member, for you to change course of tactics in attacking your best members. A regrouping is needed and it needs to happen now. Frank was never your enemy until you made clear that he was going to be your enemy. I don't consider Frank to be my enemy today. I don't consider Red to be my enemy today. I don't consider Rick to be my enemy today. Only a very small-minded, thin-skinned, and self-centered person would equate honest criticism (including the word "shameful") with being an enemy. Over the holidays I personally invited Frank to join us for a fun day of flying at Docweiler. I plan to do that again. I also plan to criticize him again. Friendship and criticism are not mutually exclusive except in the minds of those who make them mutually exclusive. I don't. Free wrote: I hope it is not too late to reverse course. Me too. But that's really up to Frank and Rick and Red. I will not muzzle anyone on this site (including myself) just because someone else is offended by what they're saying. The response to any opinion should be a better opinion ... and NOT silencing or banning (or running away). Read Frank's reply again (from your quote) and notice the very sharp personal attacks. ... I wish you hadn't destroyed our friendship. It doesn't take a PhD in psychology to see that Frank is haunted that he hasn't stood up for Joe. And like most people who are mad at themselves, Frank finds it much easier to make excuses and redirect his anger away from himself and toward someone else. The same is true of Red. Look, I'm human, and I know exactly how they feel. I know when I see myself doing something stupid or embarrassing, there's an instinctive part of me that wants to blame someone else. I haven't been in everyone's shoes, but I suspect that's what everyone feels when they do something stupid or embarrassing. It's probably a genetic survival trick to escape blame for our genetic failings. I've given this some thought, and here's what I think. 1. Bob was a jerk for starting his wall of shame. 2. Lots of people rightfully called Bob a jerk for his wall of shame. 3. Amazingly, Bob didn't ban anyone for calling Bob a jerk. 4. Amazingly, Bob didn't mutilate anyone's posts for calling Bob a jerk. 5. I want to belong to a forum where I can speak my mind to anyone. 6. Bob is still a jerk for starting his wall of shame. 7. But I'm still a U.S. Hawk ... in spite of him! That's a speech I can disagree with to some extent and respect at the same time. You are saying that Frank did nothing and that is not true. Looking for proof at USHPA or OZ or hgorg doesn't change that untruth. USHGRS eliminates the need for a doppelganger of USHPA. USHGRS supersedes a need for a competing hang gliding organization. Justice can be had much simpler by using USHGRS and Part 103 for access to flying sites than a doppelganger USHPA. 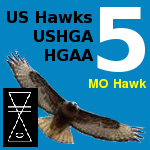 Hawks, as flying clubs instead of doppelgangers, can work for access to flying sites through USHGRS and 103. I can't make myself stop losing sleep over things that should not be happening. I've had serious sleep disorders enough in the past that interfere in productivity enough. I'm a walking example of lots of unfinished business, partially because of that. What I was thinking a few days ago, parallel to your latest barrage against Frank, was club support of USHGRS through an award grant. Personally, at this point, I don't know another way to assist that effort other than helping financially. It could be done through the Hawks as a club, if the Hawks wanted to begin some philanthropic vein to advance free flight efforts. Perhaps a Lillienthal Award? Gosh, after that, maybe a few bucks toward Frank's generous labor of designing a better trainer. I see those two as being more alike in their contributions to hang gliding than split apart by tortured logic and demands. You have a poor way of demonstrating that. Me too. But that's really up to Frank and Rick and Red. I think the course that needs to be reversed is yours. I will not muzzle anyone on this site (including myself) just because someone else is offended by what they're saying. The response to any opinion should be a better opinion ... and NOT silencing or banning (or running away). I may appreciate this about you more than anyone! Do you have a PhD in psychology? Did I dream that in a fitful night of sleep deprived torture or did you state that previously? What about neuro-linguistics and psychology at the Saulk Institute? Where did I ever get that idea? Memory is victim to sleep disorders. I don't think Frank is particularly haunted about not standing up for Joe, just because he would not submit to orders to fall on a Jack Axaopolous land mine. Well Bob might be acting like a jerk but I didn't see anyone leave for your starting a 'wall of shame'. A 'wall of shame' idea was a soft way of making a 'sticky' notice that Jack Axaopolous is a cowardly asshat that needs to be disparaged by all that see that notice. I don't know what Rick's deal was because he didn't explain it very well. He wasn't badgered by you and he wasn't put on the list like you seem to have done to Frank, Red and Michael. I'm not even sure that you have done that to them because I have seen no "Official Wall of Shame". So if there is one, it really isn't as effective as a 'sticky' notice on the front page. The WoS isn't the same as the psyop badgering of Frank, Red and Mike. Stop conflating the two different things. The WoS was fine, it probably just didn't go far enough. The WoS should not have been made ineffective/diluted by putting people on it that don't belong on it. The Wos needs to be a sticky on top if you want it to be effective. The MoHawk club has $300 (at this time) toward some kind of an award for USHGRS. Let's go down that trail instead of the one that brought us here. Back out of that rabbit hole and move forward on something positive for hang gliding. I want to contribute to Frank's efforts too. The first thing is to extract him from the bad juju heaped on him here and free him up to finish his project. That's got to come from you, Bob. Bob wrote: Here's your hint: 'All it takes for evil to thrive is for good men to do nothing." You are saying that Frank did nothing and that is not true. I know what both Frank and Mike did. You'll find them both praised by me on the Hero Hawks topic (and other places as well). But then Jack backed them both down into silence. If I can call them heroes for speaking up, don't you think it's fair for me to call it shameful when they buckled? Free wrote: The WoS isn't the same as the psyop badgering of Frank, Red and Mike. Stop conflating the two different things. Those were my criteria and I think that was shameful behavior by those people. Period. You may disagree. Frank may disagree. Anyone may disagree. I feel it was shameful and I feel it still is shameful. What's ironic here is that Frank stormed out of the U.S. Hawks simply because he didn't like me voicing my honest opinion when it became critical of him. Yet Frank is now posting on a forum where Joe Faust was literally banned right in front of Frank's own eyes with no valid justification. Frank is now posting on a forum where he literally witnessed all references to USHGRS be obliterated and where Frank can't even mention Joe's banning or USHGRS. I find it hard to equate the two at all. Warren, I don't think we're ever going to agree, and we don't have to agree. That's an aspect of forum moderation that appears lost on Jack and Davis. Warren, I don't think we're ever going to agree, and we don't have to agree. That's an aspect of forum moderation that appears lost on Jack and Davis. This is true. You are the best of all the forum moderators. You have the best forum as it applies to truth and openness. of Ranger expectation to throw themselves on the barbwire fence of Jack's coffee shop. That's all I disagree with. I'm really pleased and excited with the expansion of Pilot Pages. Kudos times a million! which leads back to some kind of award for Joe's historical efforts, plus the USHGRS. among us? I think Joe fits that criteria now for all the work and good will he has exhibited over the decades. Joe Faust is an example that we should all aspire to emulate. Sometimes I allow myself the luxury of doing what I know is right regardless of its strategic value. Free wrote: Joe Faust is an example that we should all aspire to emulate. I agree completely. I think the best recognition we can give is through our own words. Whenever an organization gets involved in giving awards, they become political. Rather than 100 people voting to give one award, I'd rather see those same 100 people each making their own personal statements of recognition as you've just done. Organizational awards tend to be all or nothing. If 51 people voted to award Joe and only 49 voted to award Logan, then Joe gets it all and Logan gets none. But if those same 51 posted great things about Joe and those same 49 posted great things about Logan, then they'd both be getting the recognition that they deserve. Lots of bad things happen when the power of the people is collected and delivered into the hands of a chosen few to redistribute for us. With regard to Frank, it's always possible that he'll surprise me. He may be quietly sending private messages gathering support for a mass exodus from hanggliding.org because of Joe's banning and other abuses. Anything is possible. I always stand ready to eat my own words and apologize. But at any point in time I can only speak on what I know to be true ... at that point in time. Having said that, every day that an injustice stands can never be fully repaid. Like a funeral-time, perhaps: Donate toward ____________________. One way for teaming: Choose a pilot that is not in the new section U.S. Hang Glider Pilots (aka U.S Hang Gliding Pilots) and do some research ... and then start the topic using the pilot's proper real name. Post some facts; maybe call the pilot; encourage pilot to post a story or photo. Bob Kuczewski wrote: Sometimes I allow myself the luxury of doing what I know is right regardless of its strategic value. Do you sometimes allow yourself the luxury to shoot yourself in the foot? Seems about the same to me. Whenever an organization gets involved in giving awards, they become political. Basically, your politics is what Joe got banned. It wasn't his politics. It was his association with you. Now you don't want to be political? I'm really confused at this point. Organizational awards tend to be all or nothing. If 51 people voted to award Joe and only 49 voted to award Logan, then Joe gets it all and Logan gets none. When Logan has 50 years of contributions equal to Joe Faust, I'll be his biggest supporter. That's fair, right? But if those same 51 posted great things about Joe and those same 49 posted great things about Logan, then they'd both be getting the recognition that they deserve. People getting what they deserve works good and bad. This brings me back to the subject of this thread. You think Frank & Red deserve the same recognition as Jack Axaopolous. Being labeled the same kinda takes the sting out of the rebuke of Jack. Where is the luxury of that? .. I guess its at Jack's coffee shop of horrors. He's sure to love it that you are attacking your friends instead of him. Fine. Throw away an opportunity to establish a little good publicity for yourself while recognizing the decades of work that Joe represents.